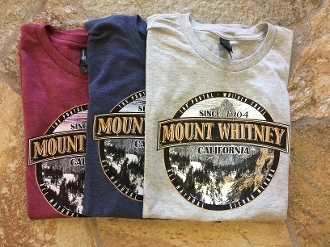 Circular Design "Since 1904 Mount Whitney California" Short Sleeve T-Shirt. Available in Red, Navy, and Light Gray. For size and color availablity please call 760 876 0030. Sizes carried are (S,M,L, and XL). COTTON-POLY Blend.